Parma, with it’s 400.000 inhabitants (180.000 in the city center and about 220.000 living in the province) is an elegant city placed in the middle of the Po Valley, in the north east of Italy, where there’s a refined atmosphere that can only be breathed in a ‚petite capitale‘. Its centre rich of art, parks and treasures from different ages, is a very welcoming place for tourists and citizens. 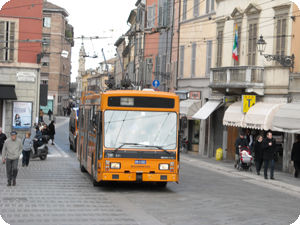 Yet Parma is not only the city itself, the monuments or the tradition in music and culture. Parma also includes the province, that gave birth to Giuseppe Verdi and to a flourishing lyrical and theatrical tradition. The territory is rich of infinite funds, with a varied landscape that stretches from the Po river to the Appenines‘ crest, with small villages rich of history and liveliness, castles, medieval parish churches and theatres spread in the countryside. Parma is also the capital of the Food Valley and is siege of primary industrial factories such as Barilla and is also renowned for the production of the Parmigiano Cheese and Parma ham.